It was interesting to hear about how Cale first relied on the disc in windy situations, but then used it more universally. Why is this interesting? Well, I did the exact same thing- and I’m super interesting! But seriously though- I had a team challenge match at our Team VSVN home course, Amesbury Pines. The conditions were less than ideal, and with wind gusts up to 50 mph blowing away even ten foot putts, every shot was a struggle. I used the Zone on every single upshot as well as all my putts. It was a confidence builder on a day when people’s confidence was blowing all over the place. Over time though, I learned how easy it is to flick the Zone on tricky upshots. In fact, I whole-heartedly recommend this disc to any flick player, as it can handle a lot of snap. I also learned that I could pipe it through wooded fairways backhand; knowing it wouldn’t bounce off trees as far as a driver or midrange. It never left my bag, and each round I played added a new “go-to” situation. My home course is Pye Brook Park in Topsfield, MA. Hole #1 is a 258 foot wide open shot, however the first 235 feet is OB and immediately after the basket is a steep downhill slope. This basically gives you an ‘island green’ that you must hit for any chance of a birdie. The Zone has become the perfect disc for this hole. I can throw it pretty much full power and know that I’m not going to overshoot the basket. The slow speed and lack of glide really take the distance away from this disc and it helps with control. Almost every upshot you throw is at a basket (interesting fact I know! ), and the Zone has a way of giving you confidence through it’s over-stability as well as it’s slow speed. Oh my gahd dude its supah flat! When it comes to plastic, it makes sense that the ESP version is preferred by most people, but it is also worth noting that if you’re actually putting with it as a putter- the Pro-D is a more natural grippy material in your hand. The problem is just that Pro-D can get beat up, and as a friend of mine pointed out, it causes the disc to turn over slightly- making it glide further than it’s ESP counterpart. This won’t be a real issue on putts, but can be frustrating for upshots. The rim of the disc is thick- like a cross between a Buzzz and a Gator. The flight plate of the Zone, at least in the ESP version, is super flat. This is the kind of flat that people want when they say “FLAT.” Some flat plates are pretty level, but they have a bit of a rise from the rim to reach that point. The Zone goes from the rim, right into a completely flat flight plate. It’s as if someone took a hair-dryer to it and shrunk it down causing the edges to pull itself as tight and flat as it could. For whatever reason, myself included, this is the shape that makes people happy. So get in the Zone people. 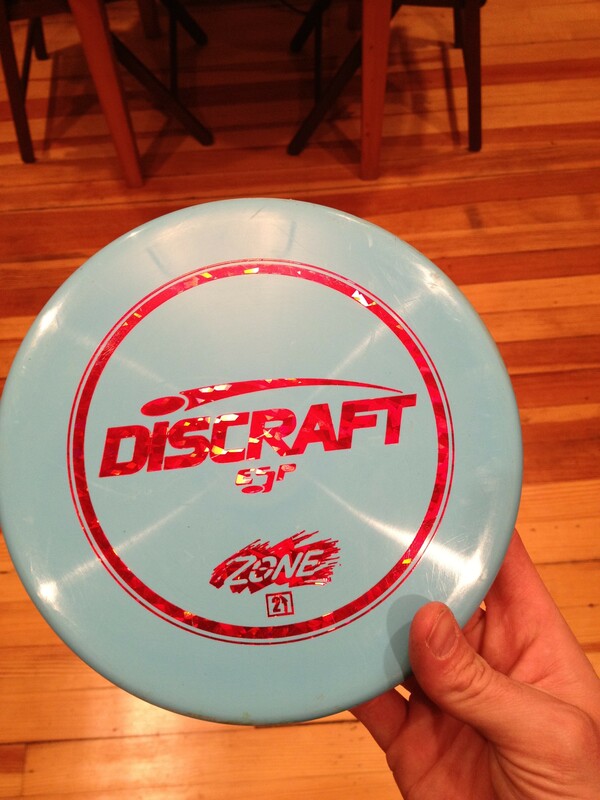 Not AutoZone- the Discraft Zone. 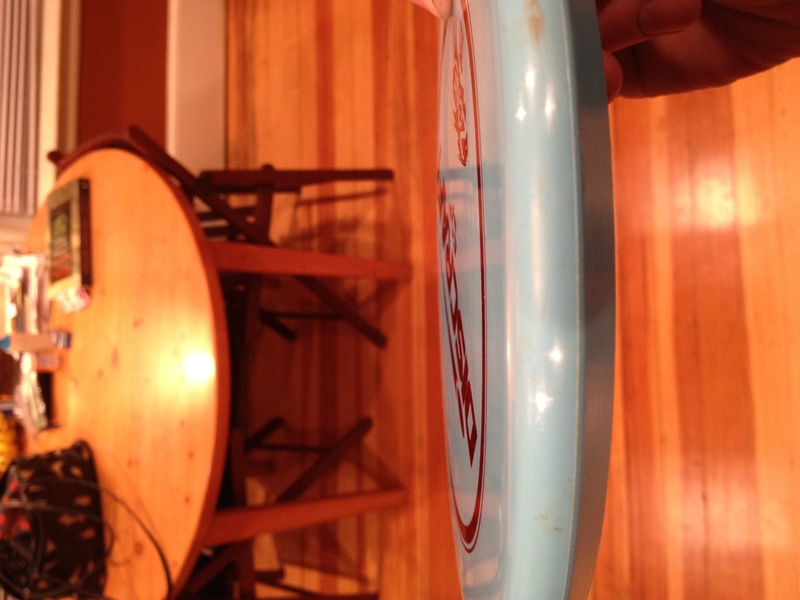 It might be called a “Putt/Approach” disc, but that doesn’t make it any less of a disc. If you like reliable, over-stable, flat discs- you’ll like the Zone. This entry was posted in Equipment and Gear and tagged cale, disc, discraft, esp, golf, leiviska, review, zone. Bookmark the permalink.